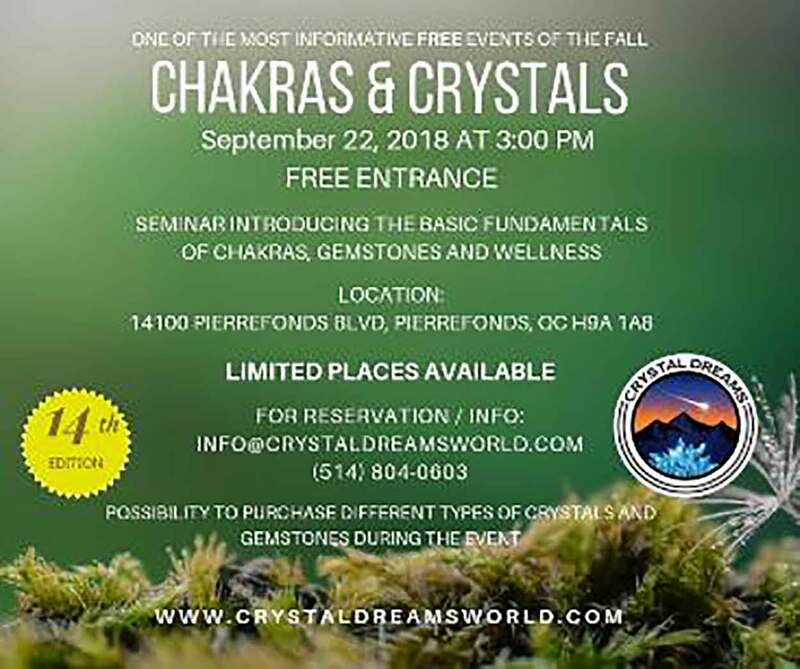 To celebrate the beginning of Fall, Crystal Dreams is organizing a FREE seminar about Crystals and Chakras. Crystals can be used to increase vital energy and stimulate our energy points known as Chakras. This is a great opportunity to learn how to effectively use these divine tools from nature. In this event, you will learn how to purify crystals and how to increase their power using certain techniques. We will then proceed to uncover the fundamentals of the Chakras and how to align them. We will also show you how to program and use your gemstones. 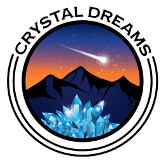 Crystal Dreams organizes many FREE public workshops and trade shows during the year. All of our events are 100% free entrance! The main goal of our events is to spread awareness about spirituality and to help individuals connect with their higher selves. – 2:00 PM to 3:00 PM: doors will be open for everyone to come see or purchase crystals, souvenirs and other natural products before the seminar. There will be a large exhibition of crystals, gemstones, clusters, geodes, jewelry, essential oils, Tibetan singing bowls, divination tools, geodes, tumbled stones, runes, diffusers, Himalayan salt lamps, exotic natural incenses and other natural products imported from all around the world. We encourage our guests to arrive early if they wish to purchase any crystals or souvenirs before the main events. – 3:00 pm to 4:00 pm: the seminar about crystals and chakras begins. – 4:00 pm to 6:00 pm: The crystals exhibition remains open for visitors. How to reserve a place? All previous events have been completely booked in the past. Don’t wait until the last minute to reserve your place. Limited places available. Sorry! Do you have information in French please, I do not speak English..
from other knowledgeable individuals that share the same interest. If you have any recommendations, please let me know. Kudos! What’s up! After reading this amazing article I feel pumped to take on all my challenges. Thanks! Hey There! I found your blog while searching for crystals! This is a really well written article. I will make sure to bookmark it and return to read more of your useful info. Thanks for the post. I’ll definitely return. I love this articles! 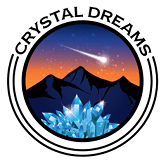 Thank you so much for bringing Crystal Dreams into this world.